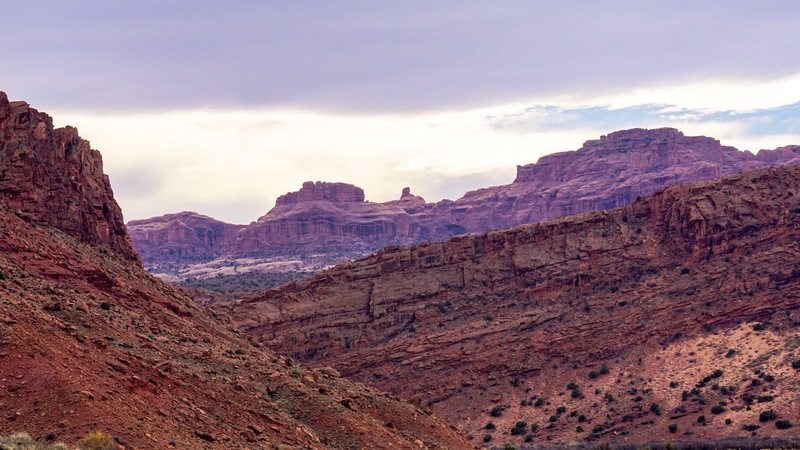 There is so much amazingness in Moab, and we covered so much territory, that I’ve decided to split this post into two parts. 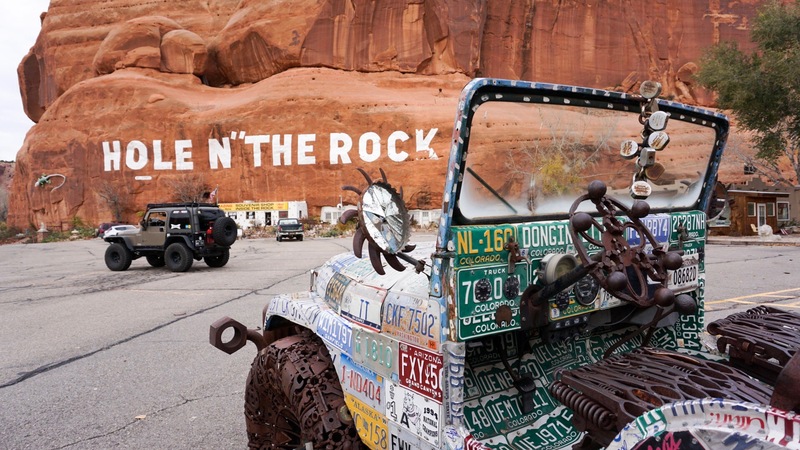 The bulk of the Jeep related content (and our visit with Becky and Jason) will be in the next post. 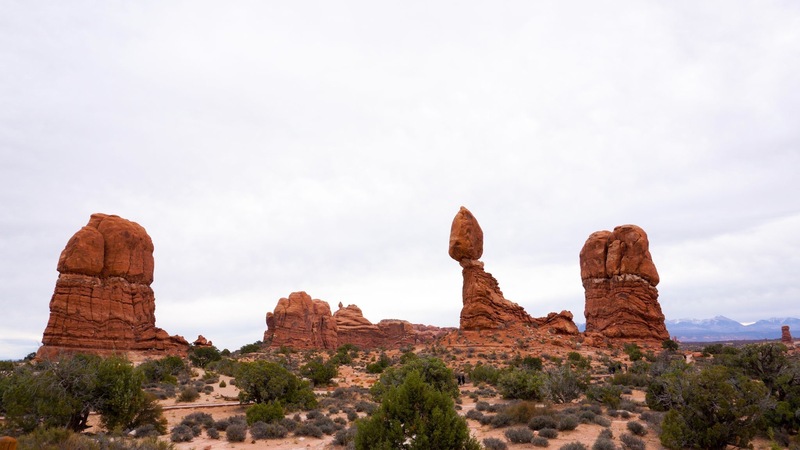 This post will cover all of our adventures before Becky and Jason arrived, most notably, our visit to Arches National Park. 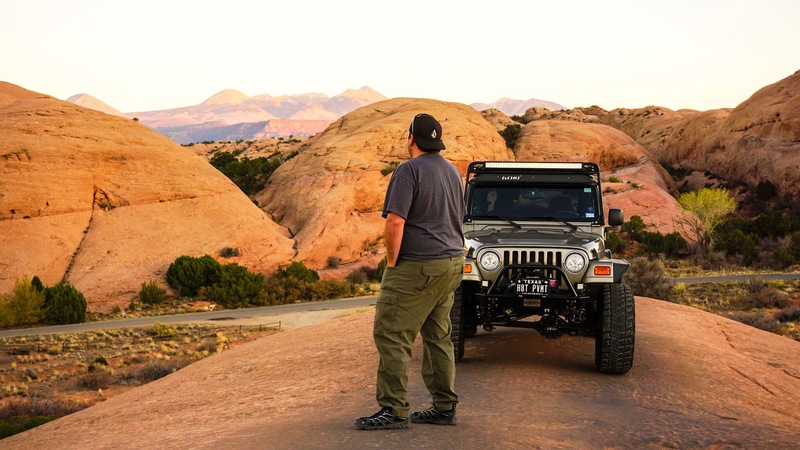 I know that I just wrote that the “bulk” of the Jeep related content would be in the next post, but I really can’t tell you about our camping spot without talking about Baby Lion’s Back. 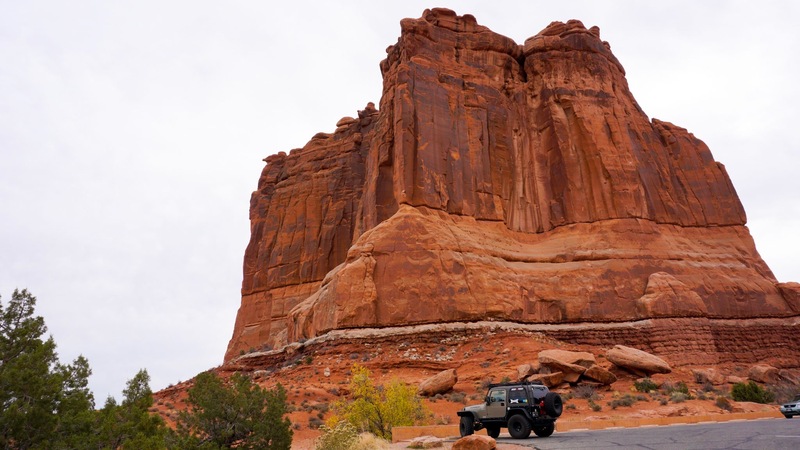 This wasn’t the most technical or most dangerous Jeep trail we would drive in Moab, and it was most definitely the shortest, but since it was right in our camping loop we drove it at least seven times. That’s right, there was a Jeep trail right in our camping loop! Brandon was in heaven. 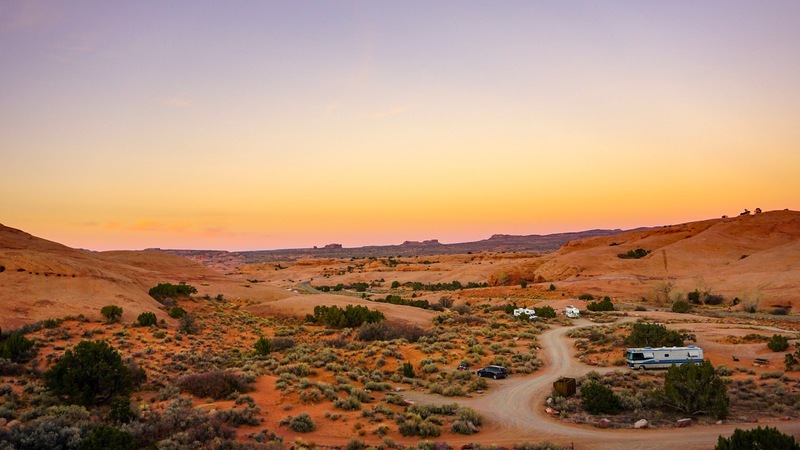 We really lucked out in Moab because the cheapest camping in the area was also the most scenic. 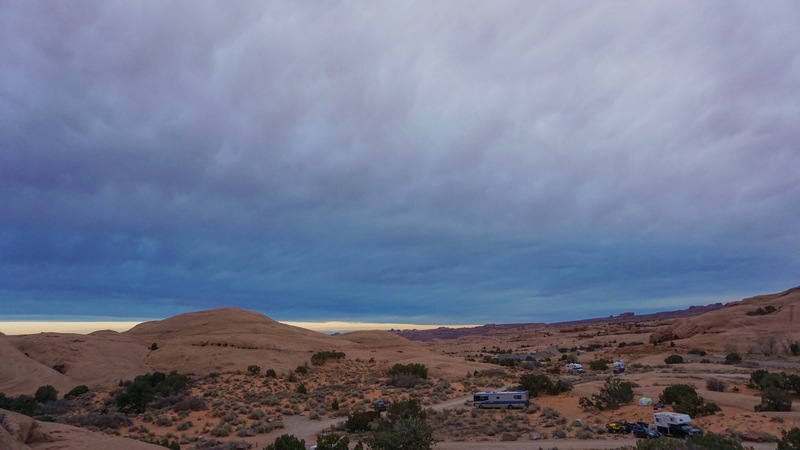 We camped at the Sand Flats Recreation Area in Loop A, spot 13 (one of the few spots that would fit a large motor home). 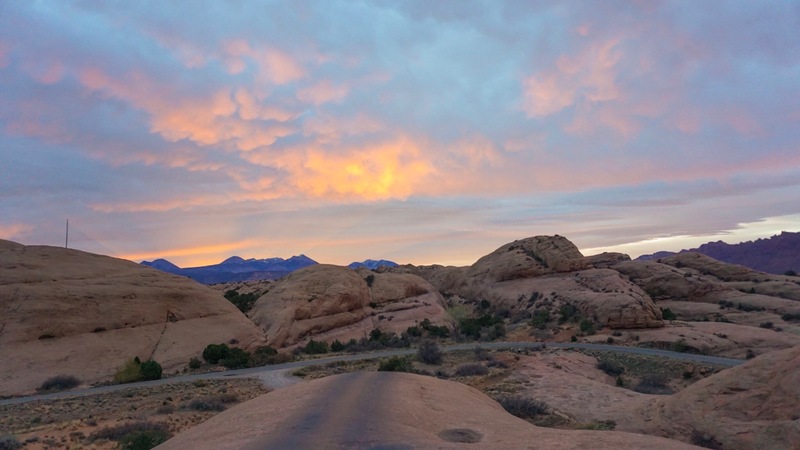 It was dry camping, meaning that each camping loop had designated spots but no utilities. Luckily, the desert provided ample sunshine for our solar panel and we were able to fire up our generator on cloudy days. We also took advantage of the free dump out and water fill at the nearby Maverick’s gas station. We think the views were worth far more than the $16 a night we paid. 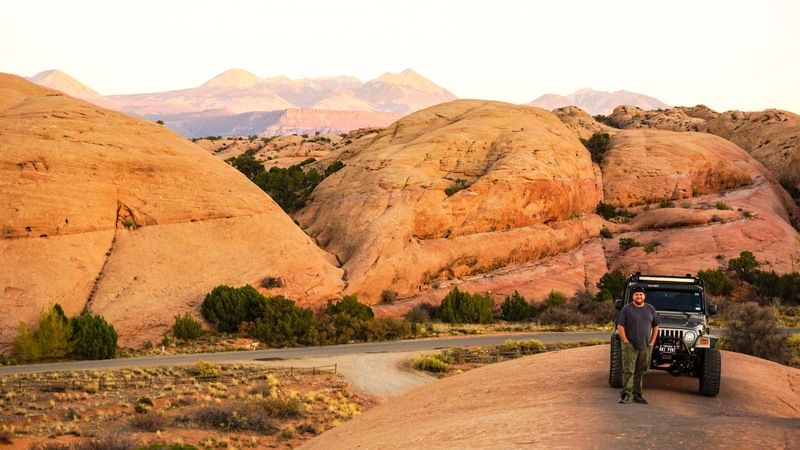 Technically, there is even cheaper camping available in the area (i.e., free boondocking on BLM land) but it wouldn’t have the added benefit of being right in the center of some of the most famous off-road trails in Moab. Fins & Things, Hell’s Revenge, Lion’s Back, and the Porcupine Rim Trail were all within minutes of our camping spot. 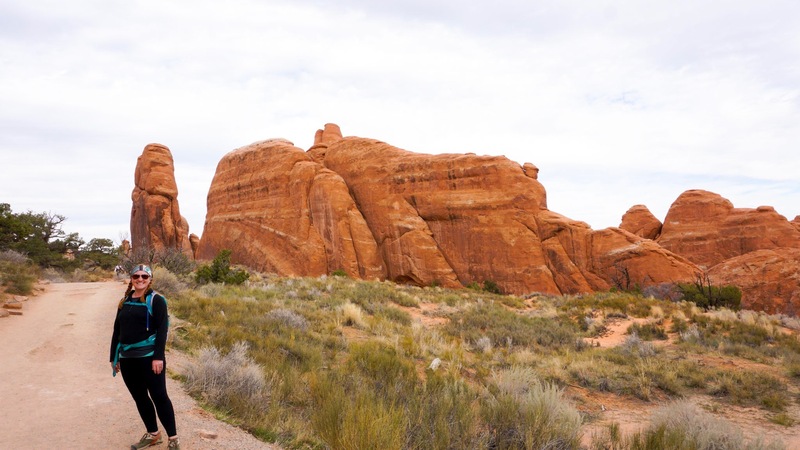 And if you’re into mountain biking, the start of the famous Slickrock Bike Trail was right next door to us. Literally. 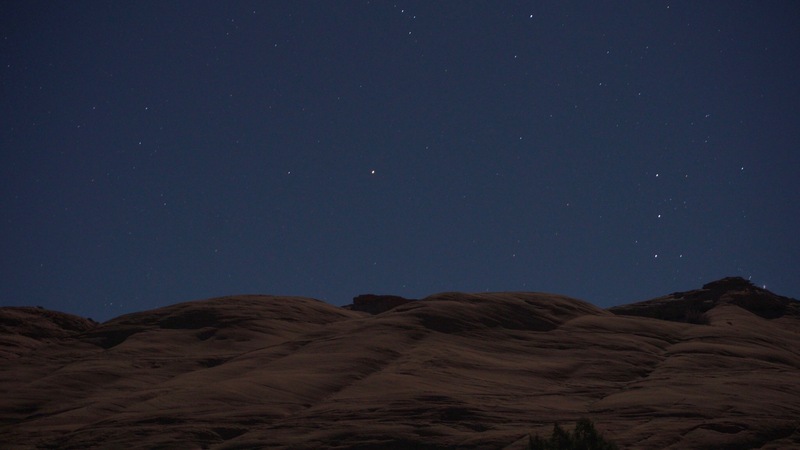 We could see it from our campsite. Unfortunately, we didn’t actually get to hit any of those trails for a multitude of reasons. 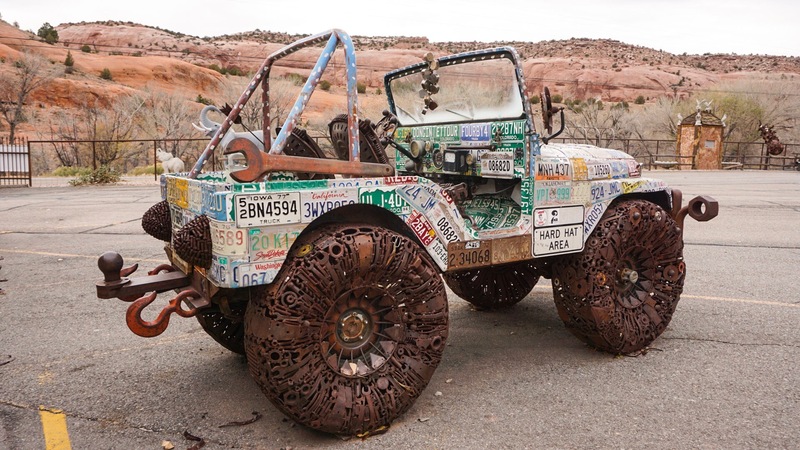 First, we really wanted to get the Jeep back to Texas in one piece and didn’t have time for repairs if we wanted to be home for Thanksgiving. Second, the groups we were riding with were not really prepared for those types of trails. But we are not complaining. Not at all. We went on some amazing trail rides with some awesome people. We’re happy to tackle Fins & Things and Hell’s Revenge on another trip, because we will most definitely be back. However, I thought it deserved explaining why we didn’t drive some of these trails when we camped so very close to them. So about Baby Lion’s Back. 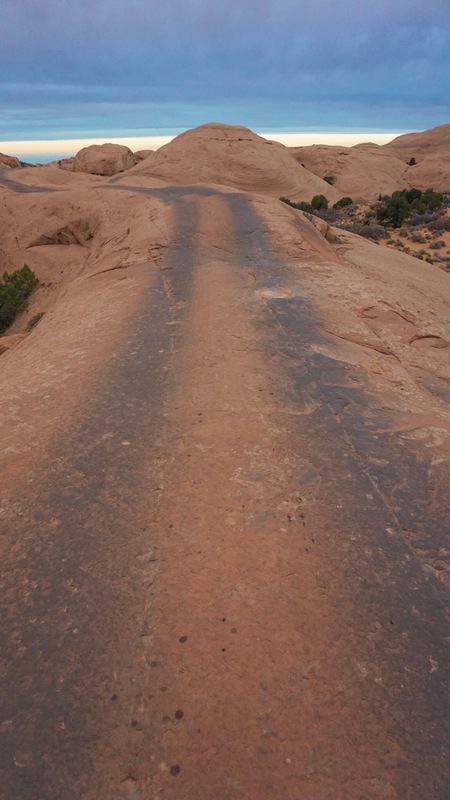 This short and sweet trail was so close to our campsite that I could take a photo of our RV from the top of the trail. Baby Lion’s Back is a miniature version of the notorious Lion’s Back trail. 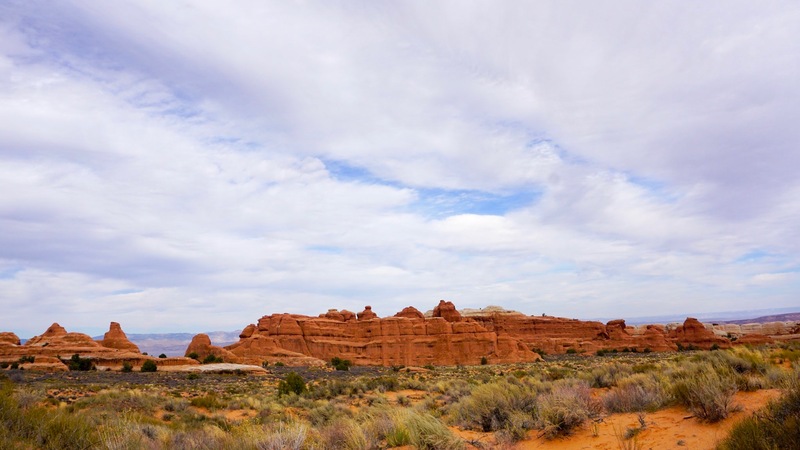 You pass Lion’s Back on the way to Sand Flats and can easily see why it is notorious. 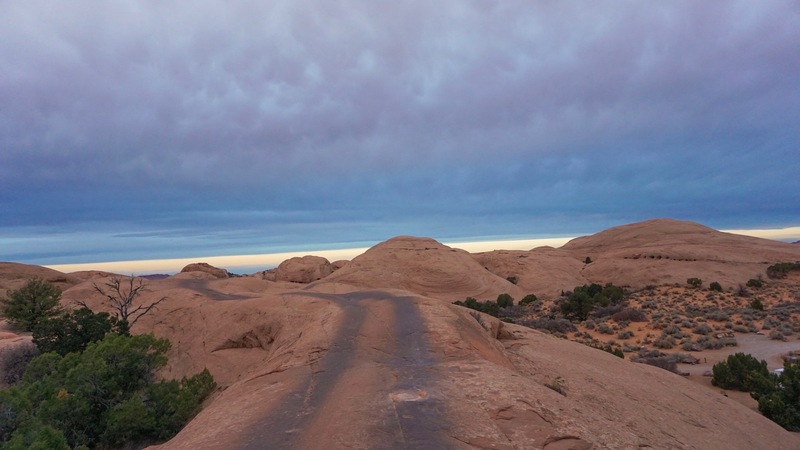 You drive up a steep narrow incline to the top of a sandstone fin. A tumble off the cliffs on either side would likely be fatal. Once at the top, you must complete a multi-point manuever to turn around and return the way you came. 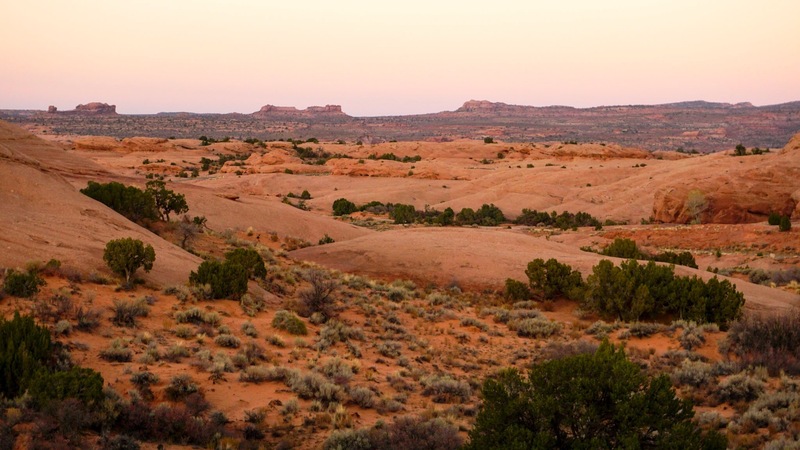 The obstacle is on private property just outside of Sand Flats but was shut down a few years, reportedly due to the high number of fatalities. Baby Lion’s Back is the much less dangerous little brother. 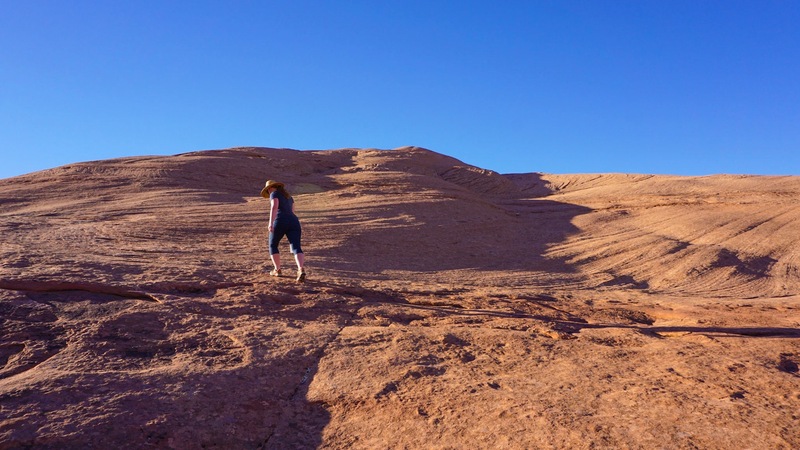 The initial incline of Baby Lion’s Back is still very steep and the drops on either side still very sudden, but the slickrock has surprisingly good traction. The top of the fin is also much wider than it appears. 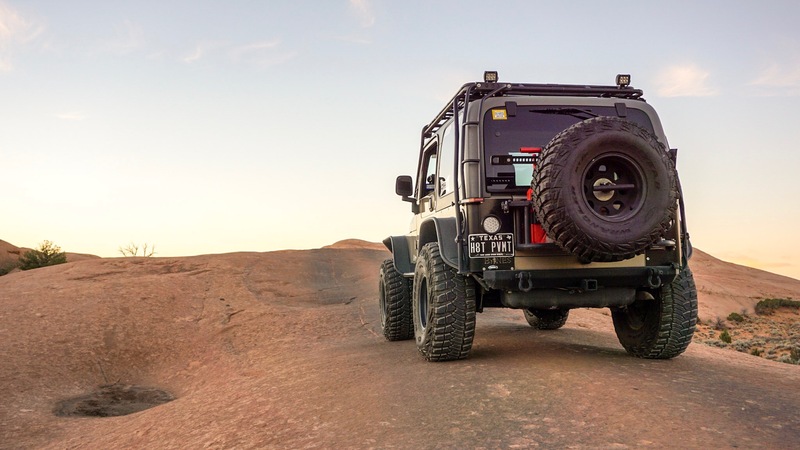 Most importantly, a tumble off the side would not necessarily be fatal, although it would most likely total the Jeep. But Brandon is a great driver and I never once feared that he was going to topple over the edge. What was most fun about this trail was that is was so short and easy, and right in our campground. 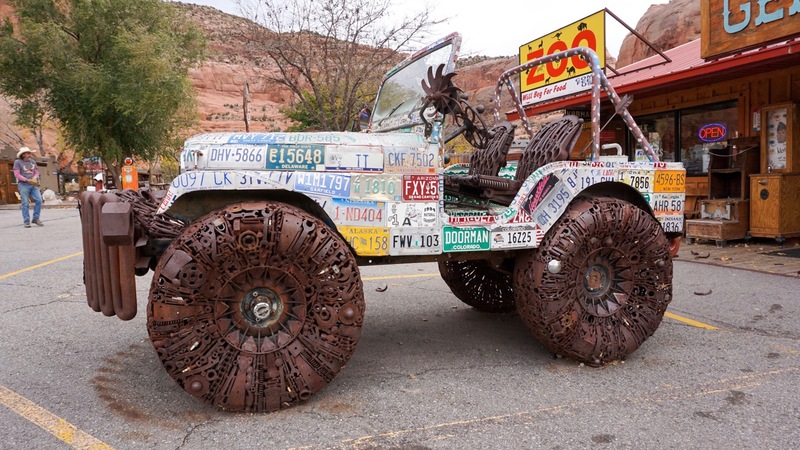 It is so short that you could drive the whole thing in about 10 minutes, less if you didn’t stop for photos. A number of times we drove to the top just for the awesome views of sunrise and sunset. Check out the short video we made of the trail to get a better feel for what it looks like in action! 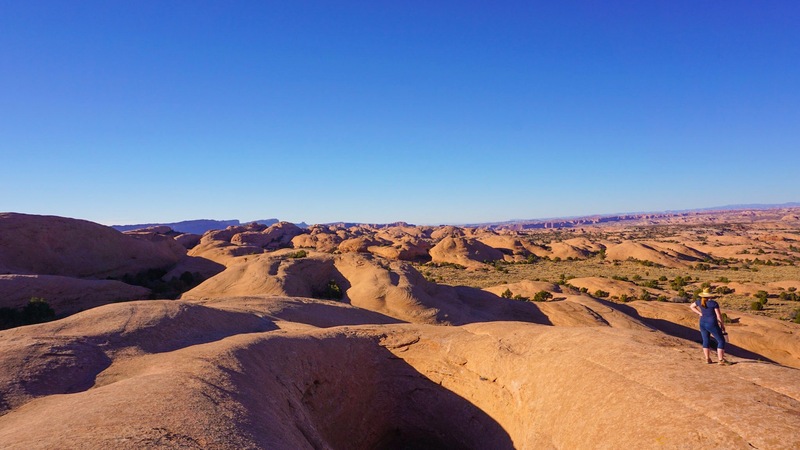 Another plus about camping at Sand Flats were the endless hiking opportunities. 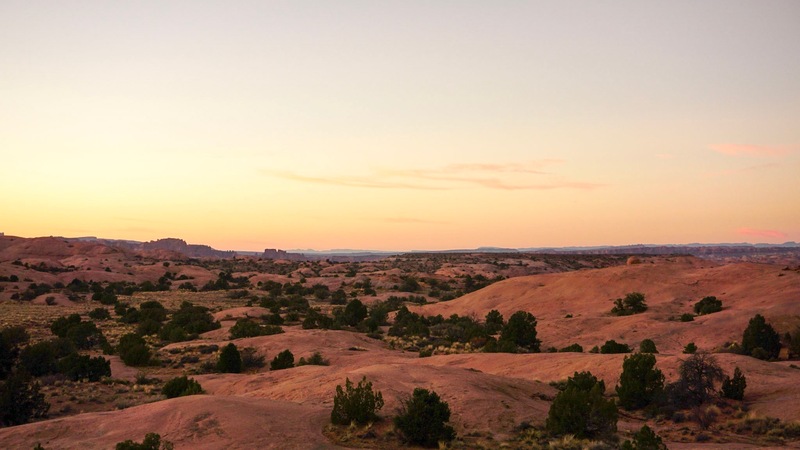 There were not any designated hiking trails that I could find, but you could spend hours or even days wandering the many sandstone hills surrounding our campsite. It is really fascinating to see how water has shaped the land in this area. At the top of this particular hill the water had been accumulating into a shallow pool that slowly dug deeper and deeper into the sandstone. And, of course, the view of the stars wasn’t too bad either. We were also there during the Super Moon, which was so bright that even in the middle of the night we could see clearly without any artificial light. 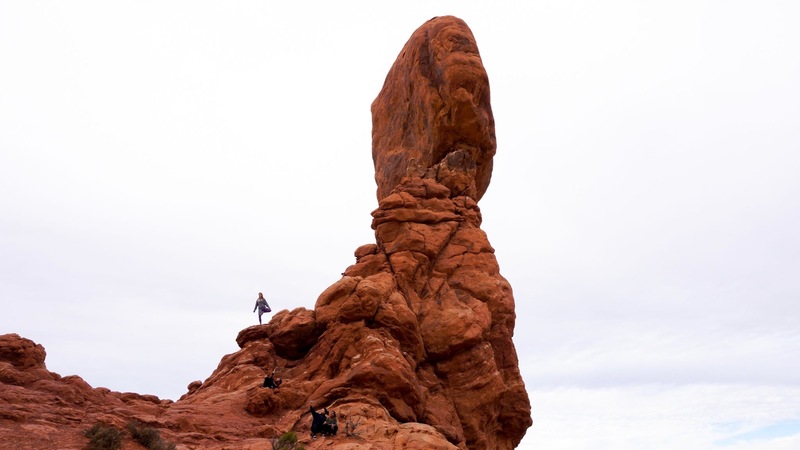 The photo below is one of the reasons I wanted to visit Arches National Park. 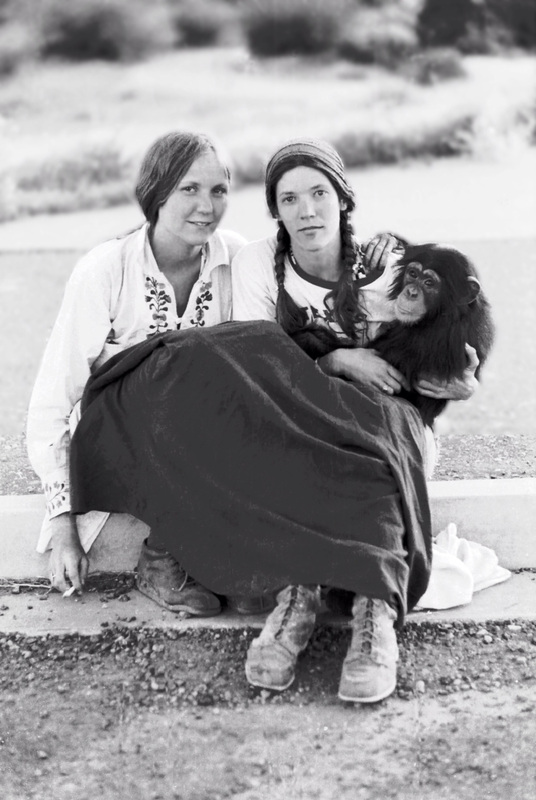 That’s my mom on the left and my Auntie Lyse on the right holding her chimp Lily. See Lovey and the Cowgirl Go West for more info on my mom and Lyse. The photo was taken by their friend Jerry Walsh some time in the early 1970s. I grew up seeing this photo framed on the wall in my parent’s living room. I always thought it was really special. Something about it just perfectly captured all the stories I had heard about my mom’s youthful hippie days. 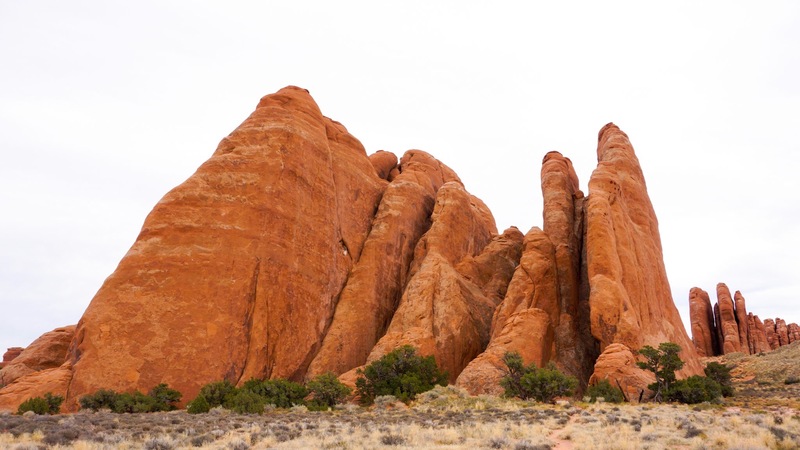 I also always thought the photo was taken at Arches National Park. When I was 11, my mom and Lyse took my brother and I on a road trip out west that somewhat recreated the road trip they had been on when this photo was taken. 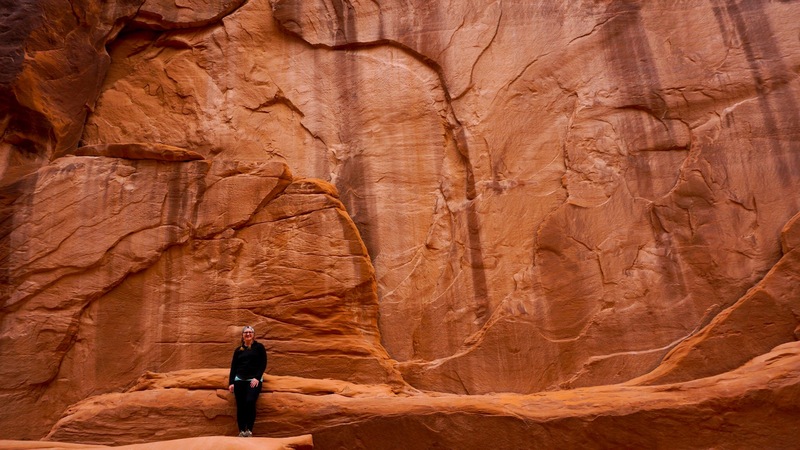 We hiked through Arches National Park, went white water rafting, and rode on the Durango Silverton Railroad. We apparently also hiked through Natural Bridges National park, which is where the classic photo of my mom, Lyse, and Lily was actually taken. 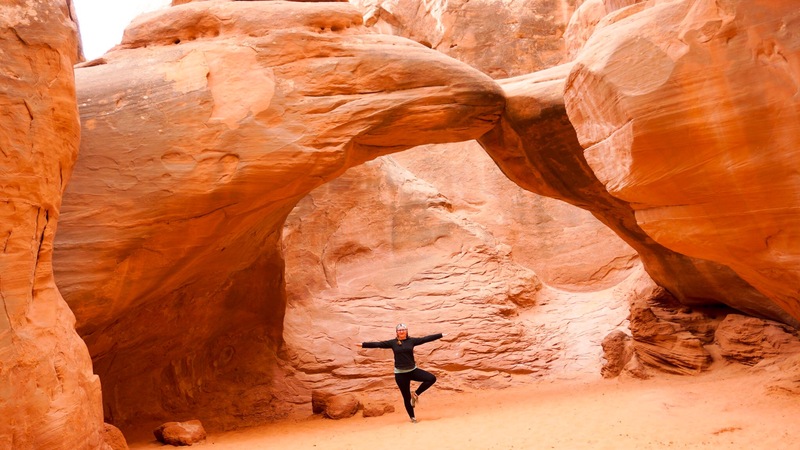 It seems that I have been confusing Natural Bridges and Arches National Parks my entire adult life and had been completely wrong about the location of the photo. 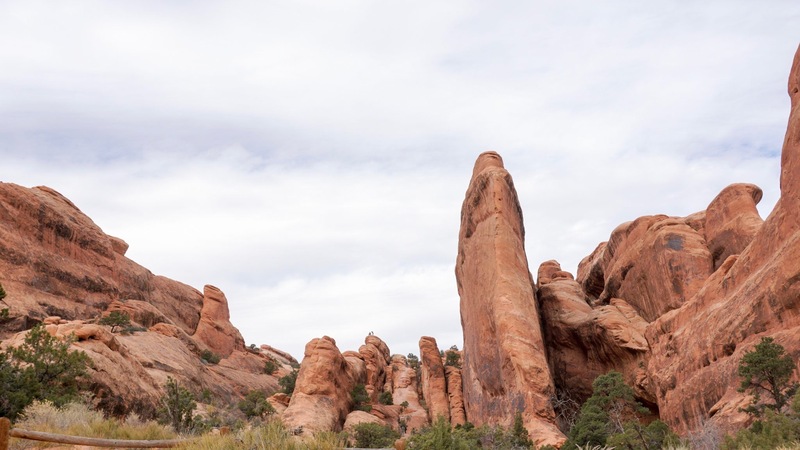 Unfortunatly, I didn’t figure all of this out until I talked with my mom after we visited Arches and were unable to find the trail I was remembering from my childhood (it was at Natural Bridges, not Arches). It’s funny how memories work. 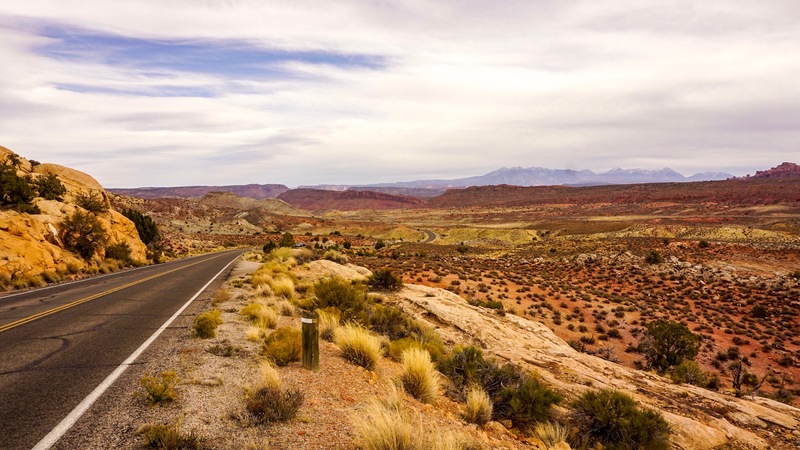 Over the years (and with enough retellings of the same story) we can convince ourselves of something that is not entirely accurate, much like Brandon’s memory of Oak Creek Canyon in Arizona. 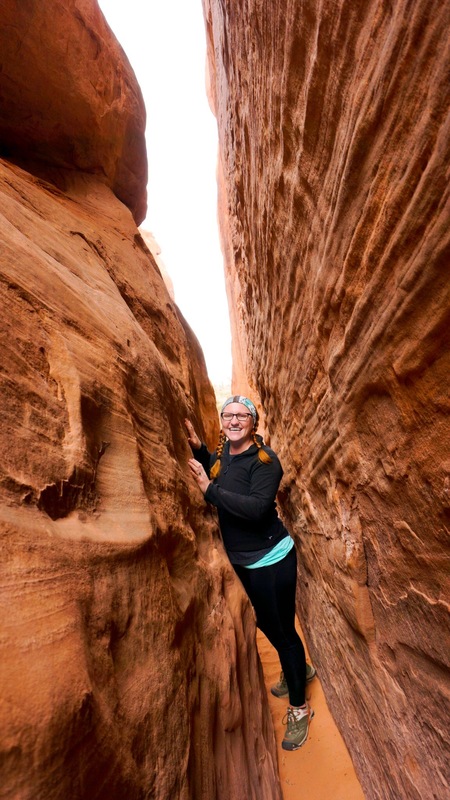 Arches was still an amazing stop, despite the fact that I wasn’t able to find the trail from my childhood and recreate the photo of my mom, Lyse, and Lily, like I had hoped to do. 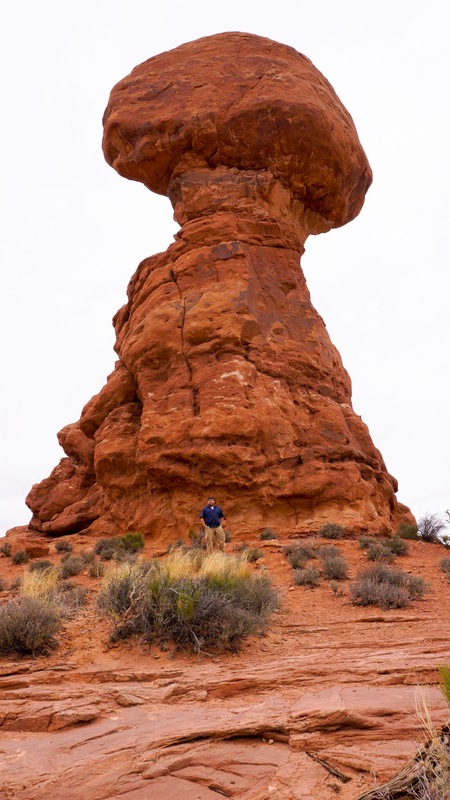 I suppose we will just have to make another trip to Utah and visit Natural Bridges next time! 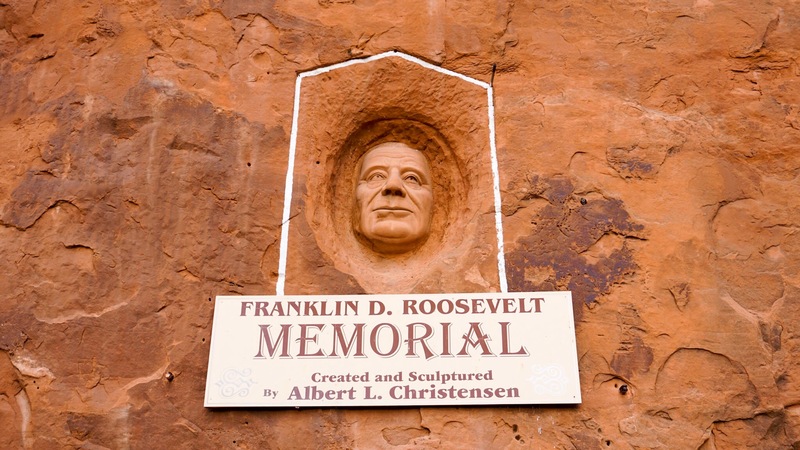 The photo below was taken near the entrance to the park. 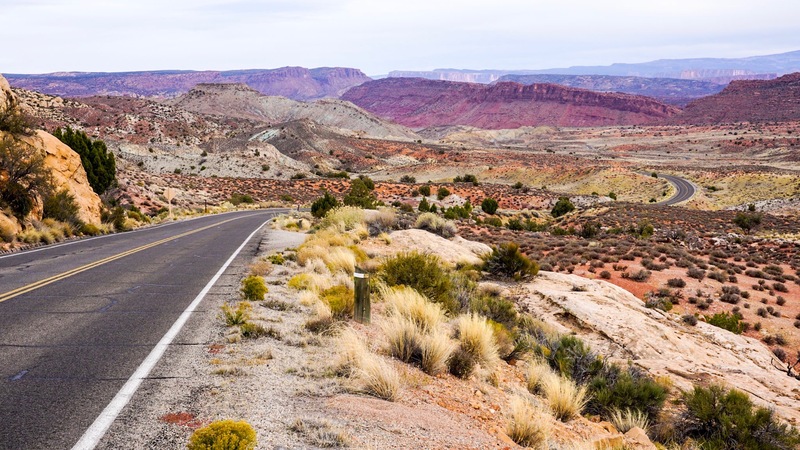 The road you see was actually built on top of the fault line that runs through Utah. 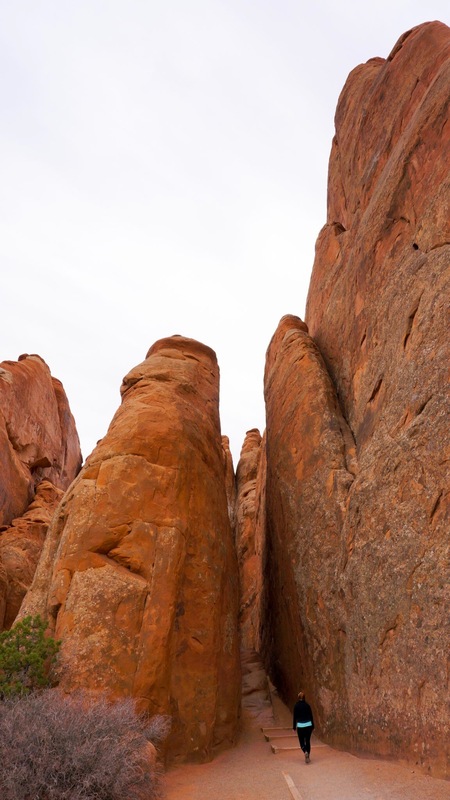 Geologists believe that the two rocks below were once connected by an arch that has since collapsed. 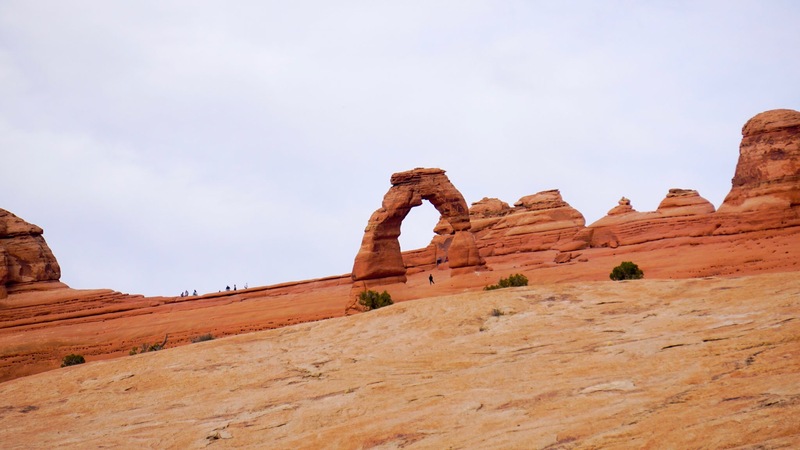 All of the arches and rock formations within the park are the result of erosion, meaning that all of the arches will eventually collapse. However, this also means that new arches are still being formed. The constant but gradually changing landscape is something that makes this area so fascinating. 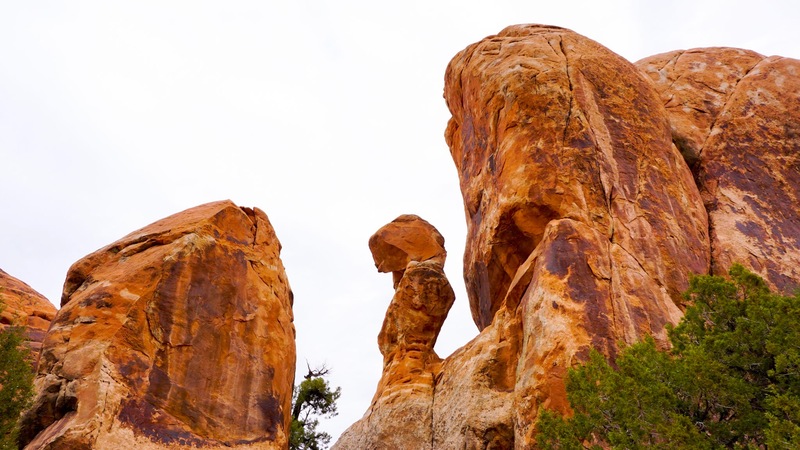 Balanced Rock is a quick and easy trail and one of the first you come to when driving through the park. 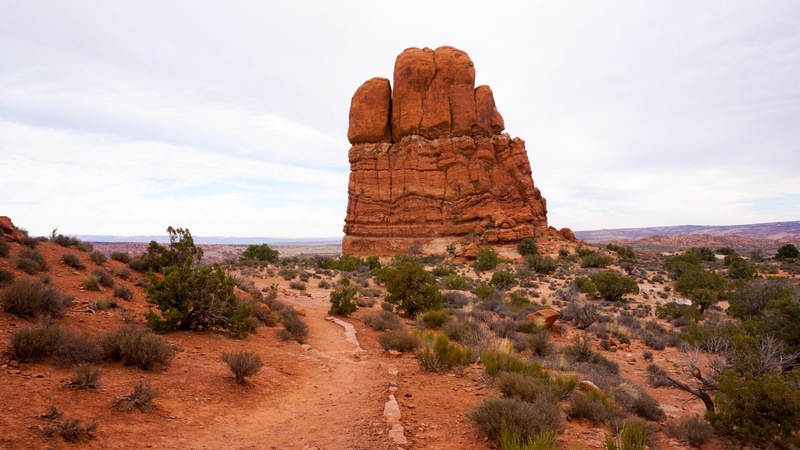 The whole loop is less than a mile long and takes you up to and around Balanced Rock. The giant boulder perched precariously on top of its pedestal looks as if it could topple over at any moment, and technically it could. 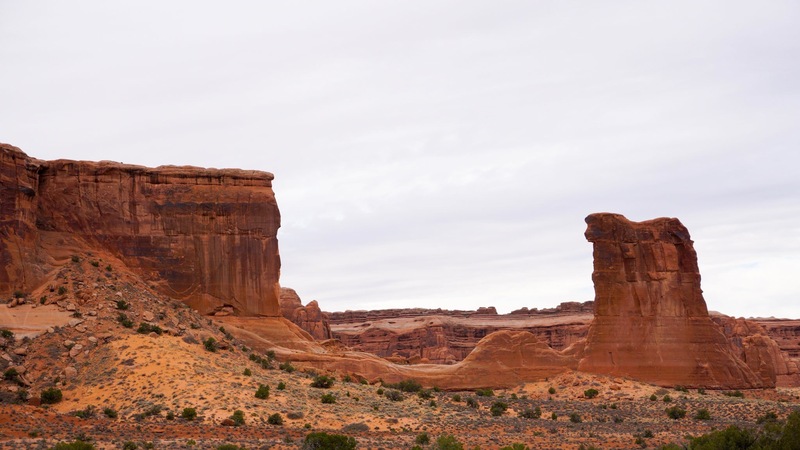 It doesn’t happen often, but every once in a while a portion of one of these delicate rock formations falls off, completely changing the landscape. It makes me wonder if they ever have to change the names of the trails because the name no longer fits. We started seeing these stacks of rocks in Sedona. 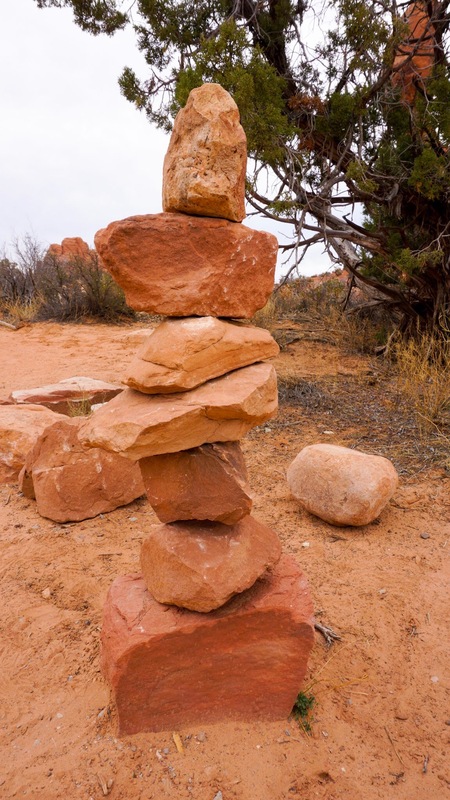 They are technically called cairns and are most frequently used as trail markers. Unlike trails through a forest, trails over slick rock are generally invisible. The cairns are used to guide you in the right direction until the trail becomes visible again. 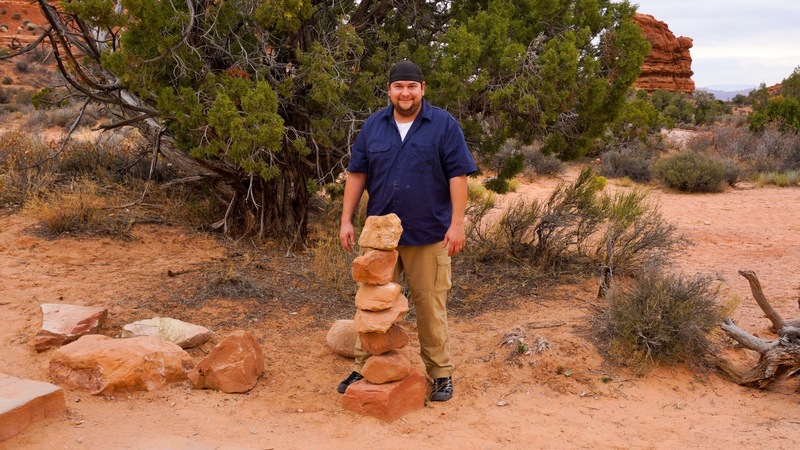 Brandon likes building new ones, but really, Mother Nature is the ultimate rock stacking champion. 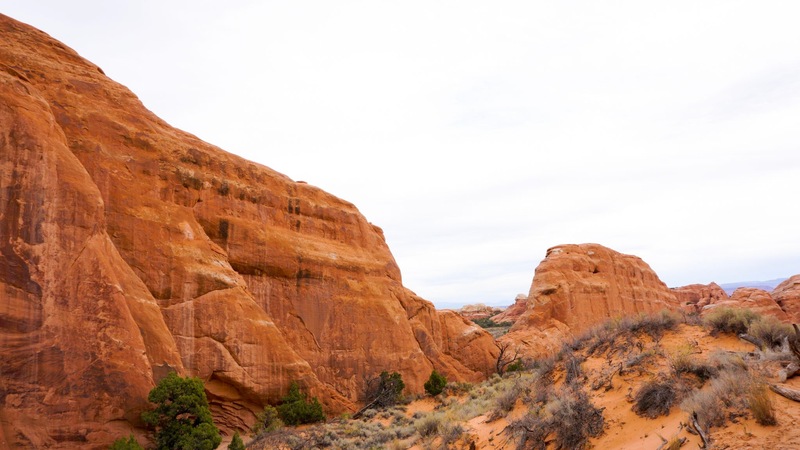 Sand Dune Arch was probably our favorite trail in the park, even though it was less than a half mile long. 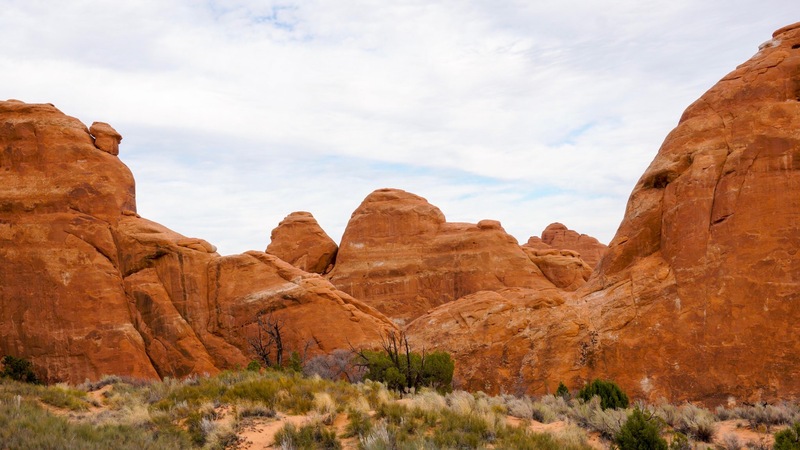 The rock formations in Arches and the surrounding area are the result of water, extreme temperature, and time. 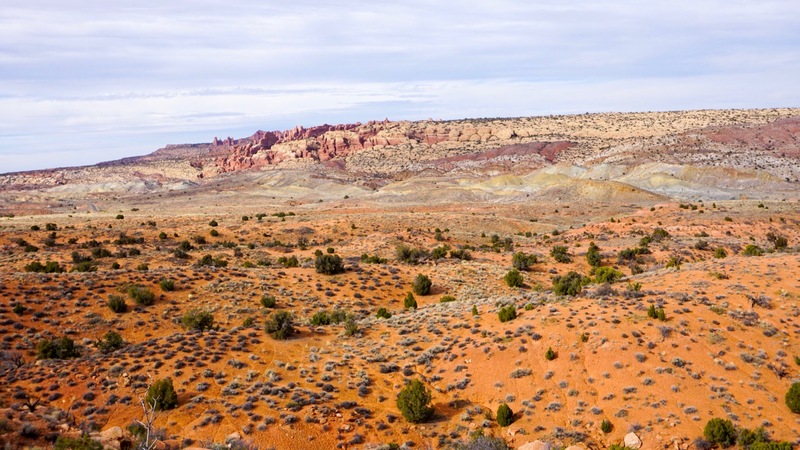 Around 300 million years ago this entire area was covered by sea water. When the sea evaporated it left behind an extremely thick layer of salt. Over time, flood waters and the receding ocean compressed the salt and sand into rock. This still left a huge underground salt bed beneath the park. The pressurized salt was very unstable and gradually shifted and crumbled, pushing layers of rock to the surface. Furthermore, the entire area lies on top of fault lines, which also contributed to the jagged landscape. However, geologists admit that this story could be partially or completely inaccurate, as the evidence is largely circumstantial. The tall slender cliffs are called fins. 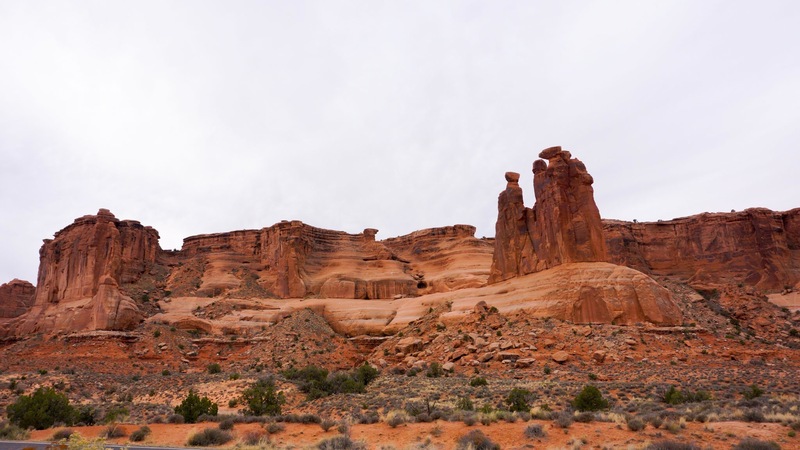 They are the eroded remains of enormous slabs of sandstone. Water seeped through cracks in the stone, breaking the slab into lines. 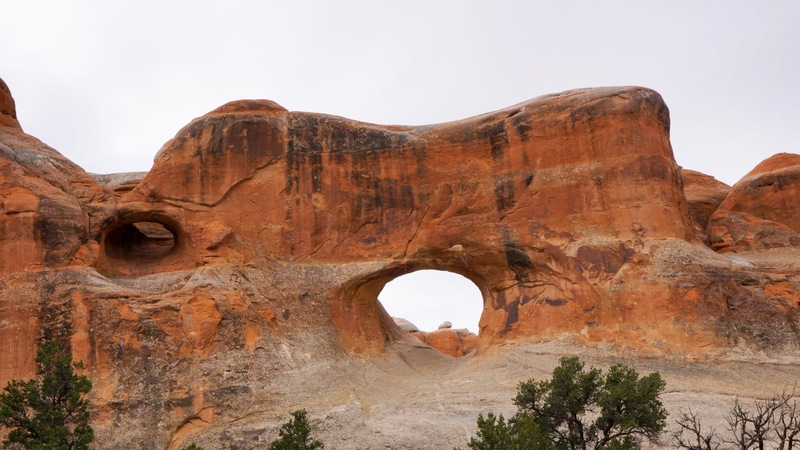 Erosion eventually caused holes to develop in the sheets of stone, forming the arches. 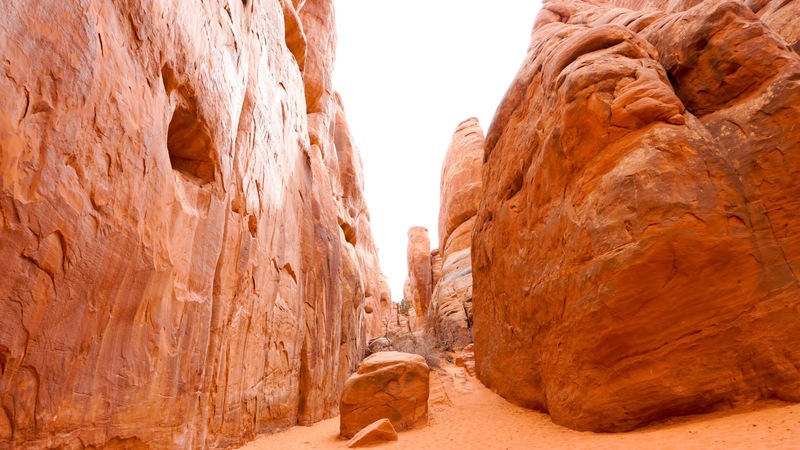 The Sand Dune Arch trail is really just a short walk between two of the fins. 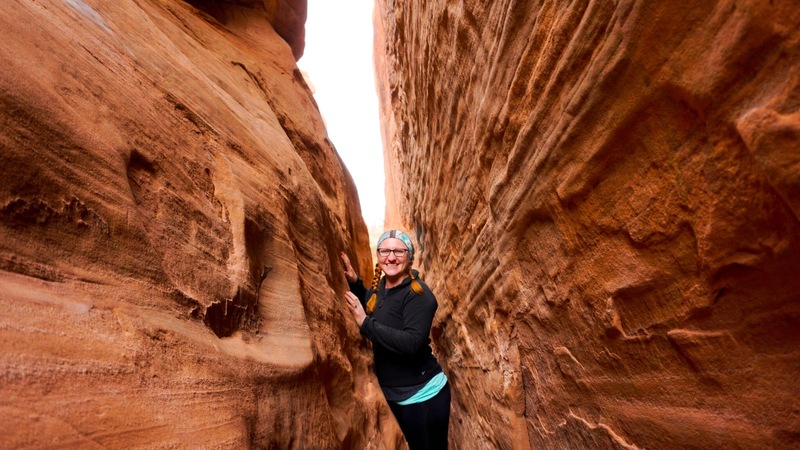 The fins are very close together and feel like walking through a sandstone tunnel. As the fins have eroded they have left a thick layer of soft sand between the fins. It was nature’s sandbox! 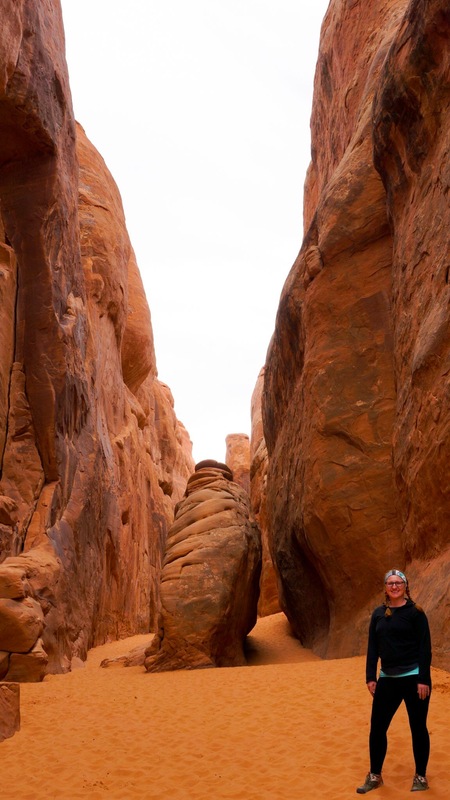 While Sand Dune Arch itself was lovely, our favorite find was the narrow portions at the far end of the trail. We thought the photos made it look like we were in some sort of vortex. 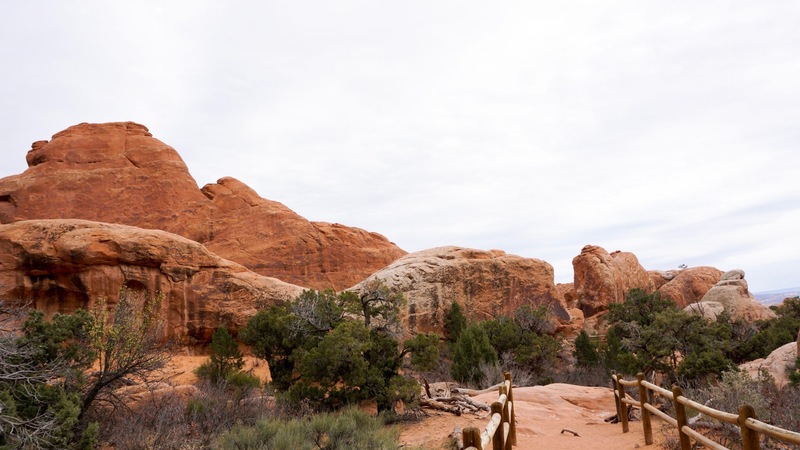 At 306 feet from base to base, Landscape Arch is both the longest and slenderest arch in the park. 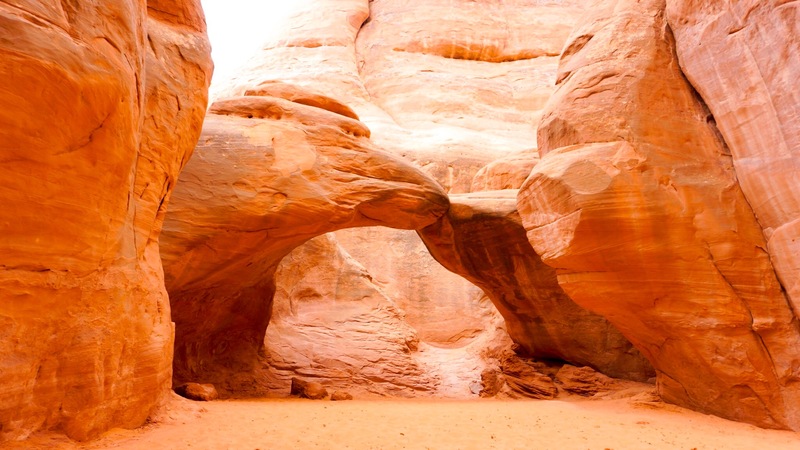 Landscape Arch is also a wonderful example of the dynamic nature of this landscape. In 1991, a 4 foot thick, 60 feet long, 11 feet wide slab of rock crumbled and fell from the underside of the arch. 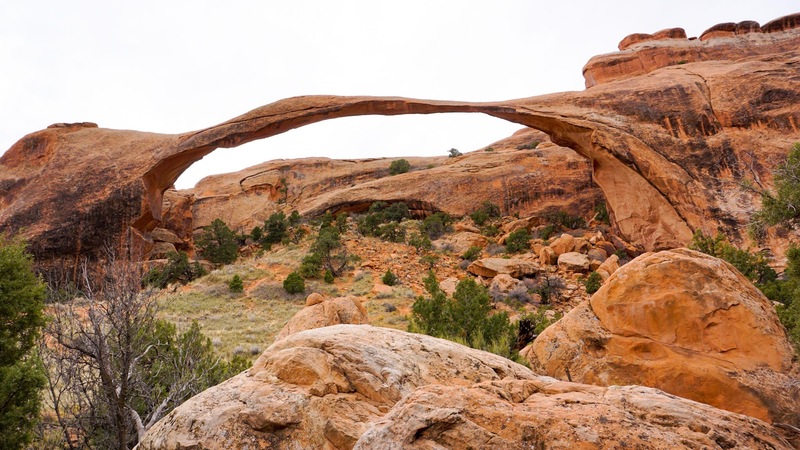 A group of hikers were having lunch underneath the arch when the slab fell, but luckily no one was injured. 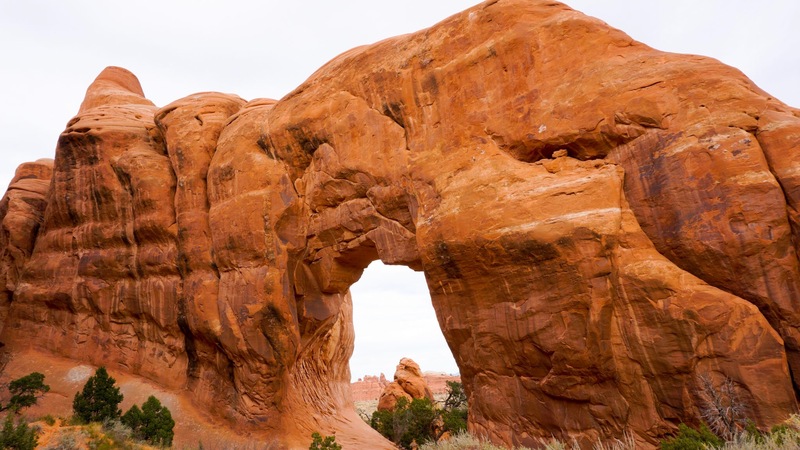 Additional portions of rock could fall, or the entire arch could collapse, at anytime. 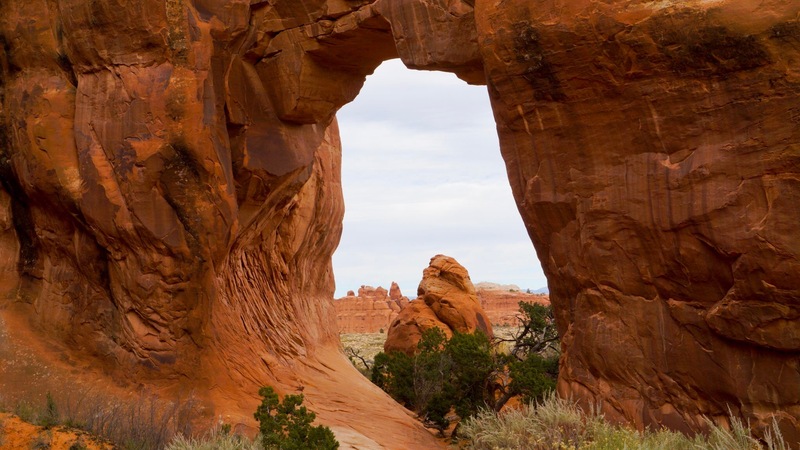 Consequently, the parks service has permanently closed the portion of the trail that goes under the arch. You can still view the arch, but only from a safe distance. 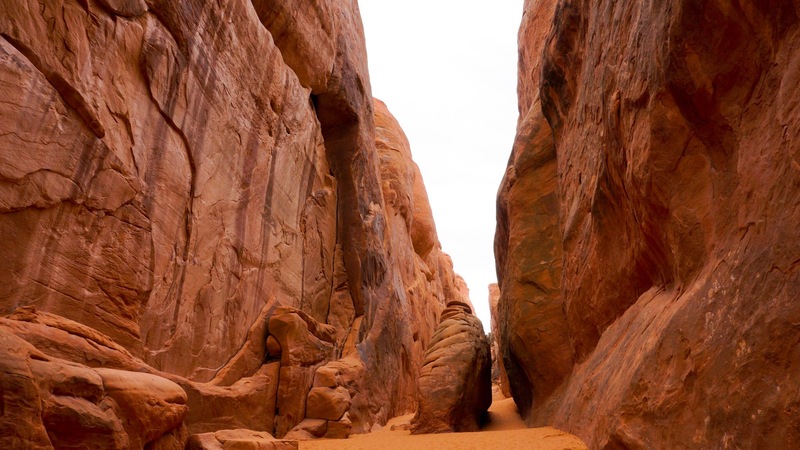 The Landscape Arch trail really packs a punch into 1.6 miles. 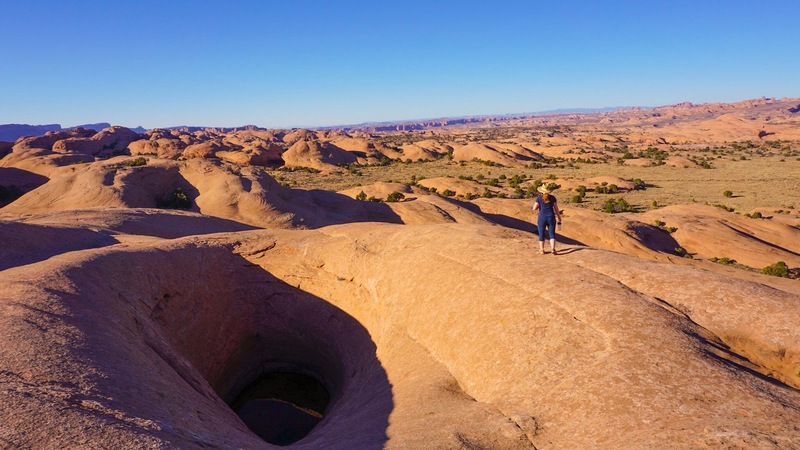 In addition to viewing a precarious arch that could fall at any moment, you can take a short side trail to see two other arches, Pine Tree Arch and Tunnel Arch. 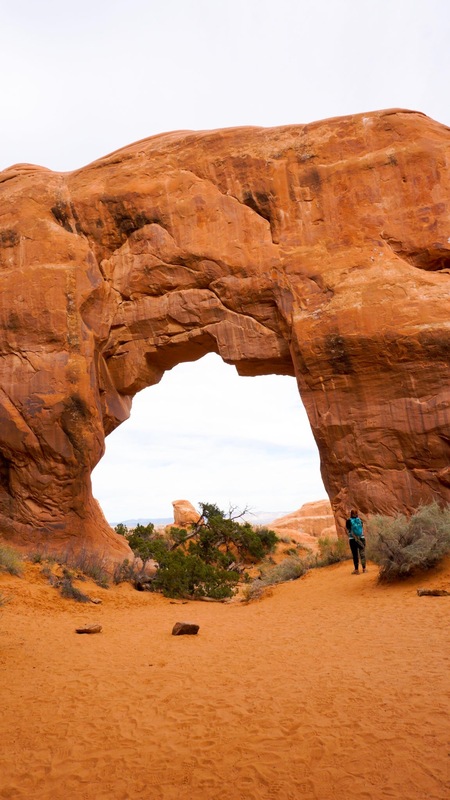 Landscape arch is one of the most popular trails in the park and it’s easy to see why. 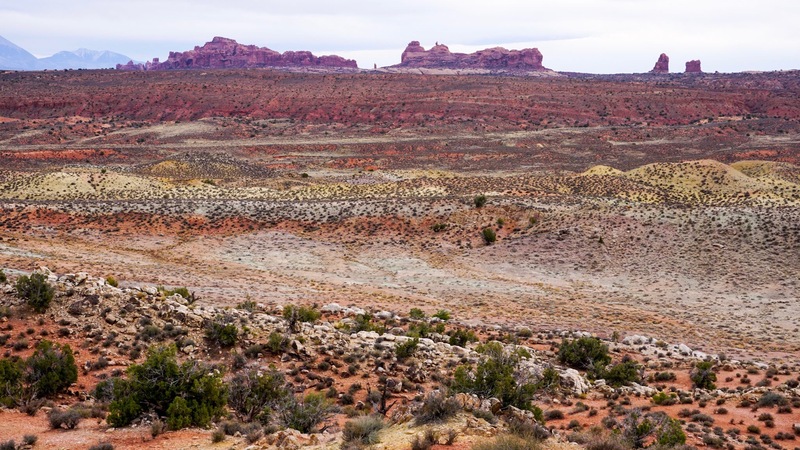 Between the red of the sandstone and the various colors of salty mineralized sand, the canyons within the park look as if they have been painted with watercolors. 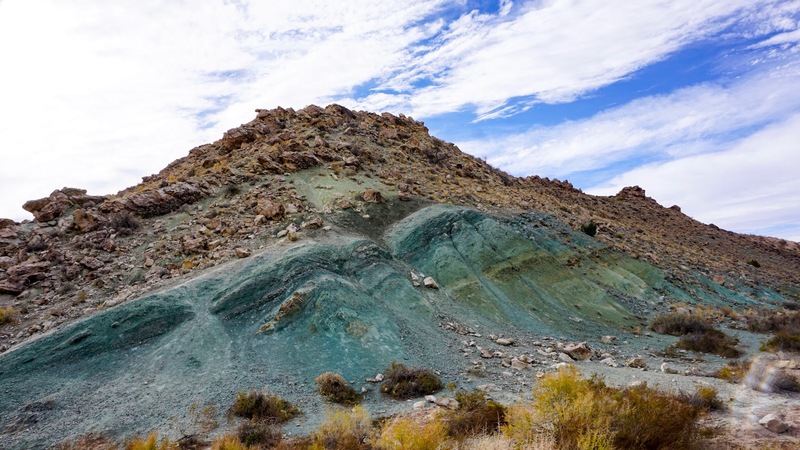 I never actually figured out exactly which mineral compound made up the turquoise hillside but the result is gorgeous. 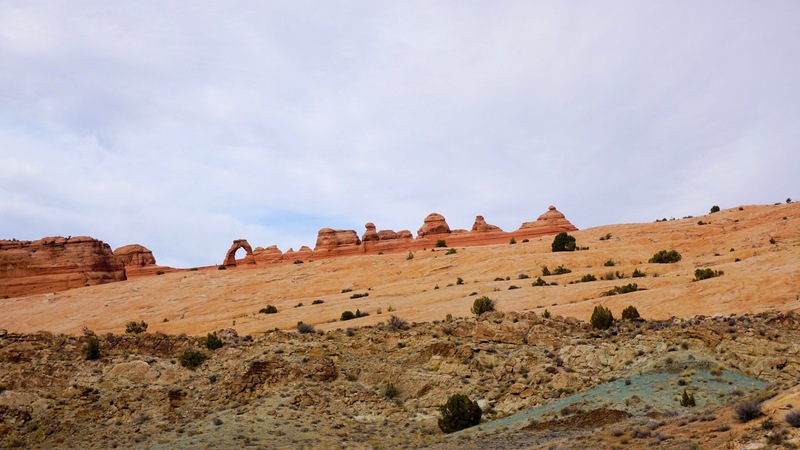 It may be overshadowed by the majestic arches, but the soil in this area is actually really fascinating. 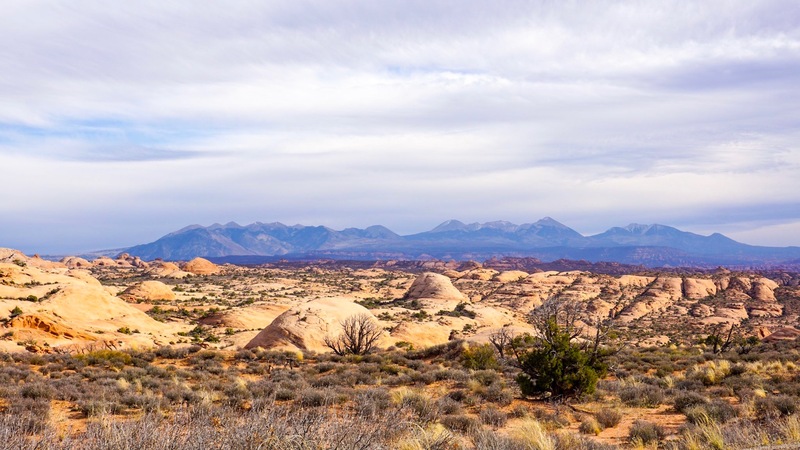 The deserts here are actually topped with a living crust, a biological soil layer made up of tiny organisms (cyanobacteria, algae, moss, fungi, and lichen). 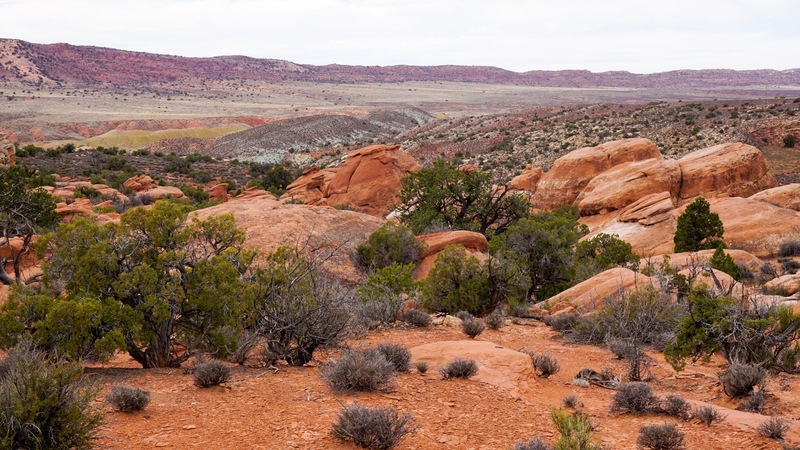 This top layer is an essential element in the desert ecosystem. The crust holds the loose sand together, forming a stable, water-absorbing surface, full of vital nutrients. 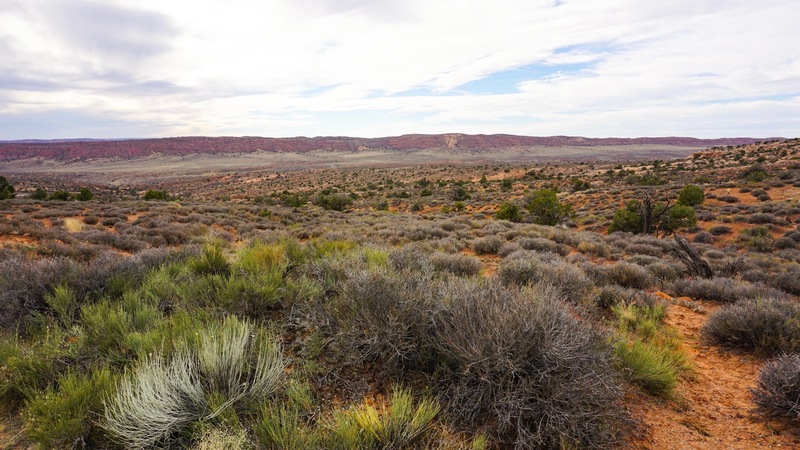 This crust allows a large variety of plant life to thrive in this harsh environment. Unfortunately, this crust is also very delicate. It requires five to ten years to fully develop. Stepping off the established trails can break the crust and allow it to blow away in the wind, destroying decades of growth. Delicate Arch is undoubtedly the most popular trail in the park (it’s the same one you see on all of the postcards and on the Utah licence plates), but we never actually hiked it. 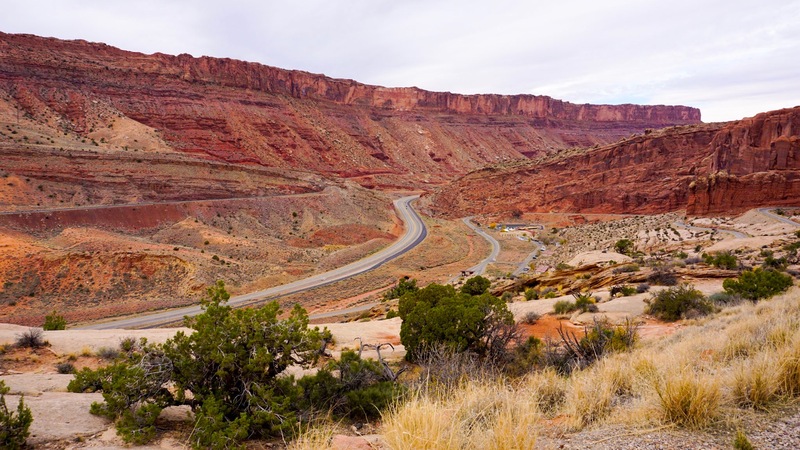 We skipped it on our trip through the park because we had made plans to hike it with our friends Becky and Jason once they arrived in Moab. 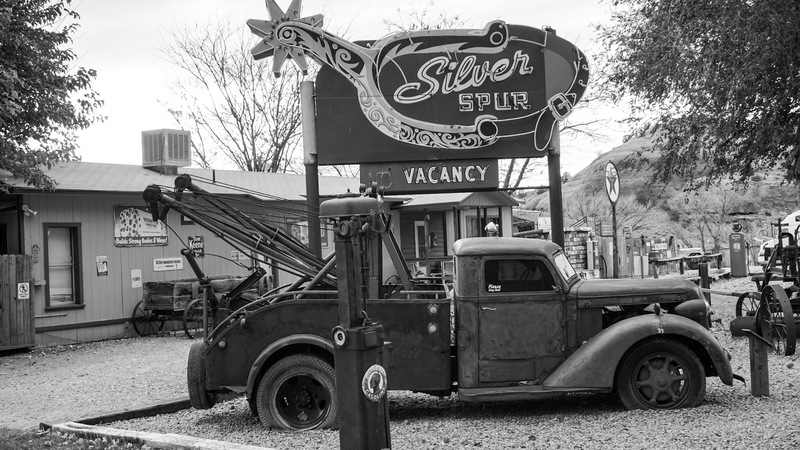 Unfortunately, we needed to deal with other business on the day of the hike, specifically taking the RV to the dump station at Maverick’s, and as a result were not able to go with them. 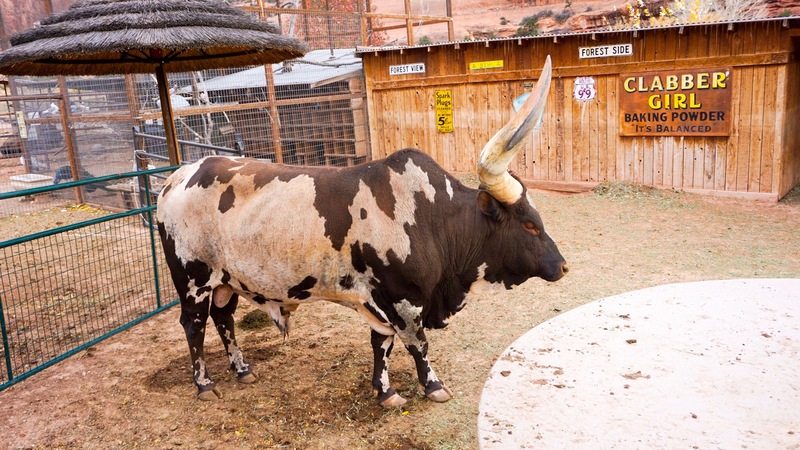 They told us that it was absolutely amazing and was a highlight of their trip. 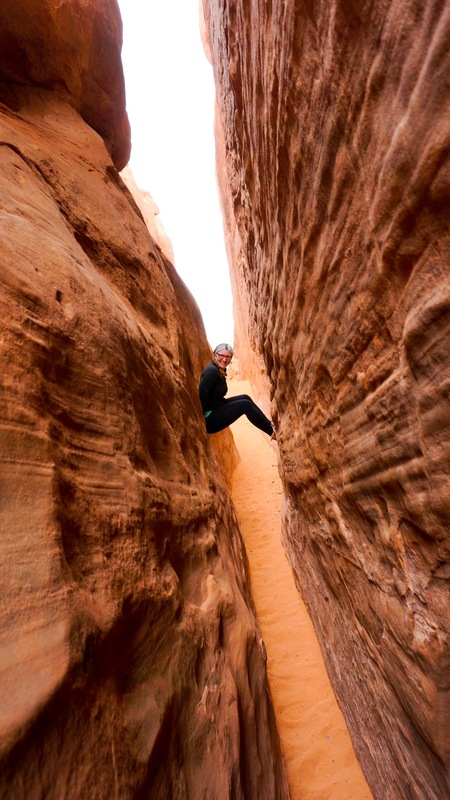 Luckily, we have every intention of returning to Moab one day and will be sure to hike the trail next time. 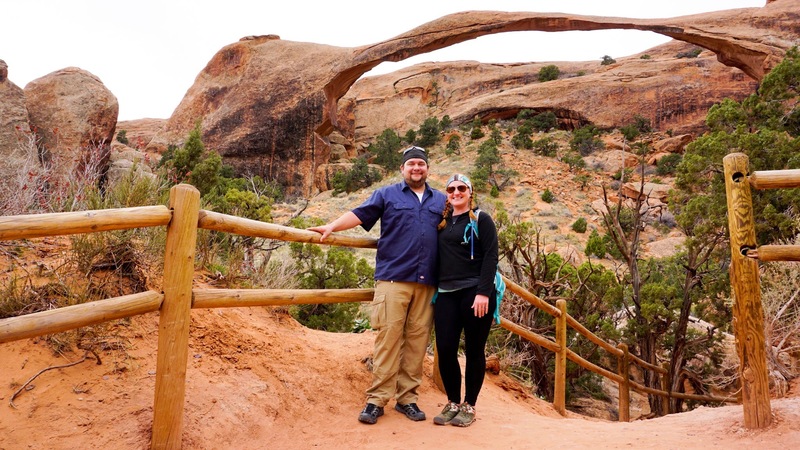 Although we weren’t able to hike up the big hill and see it up close, we did drive in front of the arch and take a few photos of the most photographed natural arch in the world. 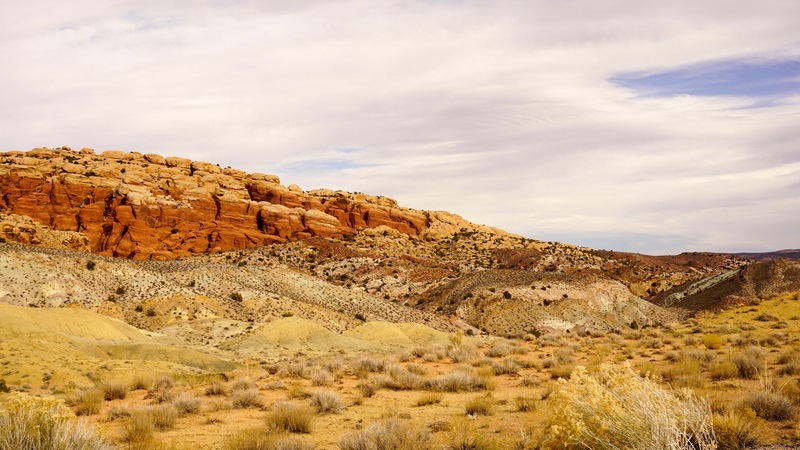 The mounds you see in the photo below are actually petrified sand dunes. 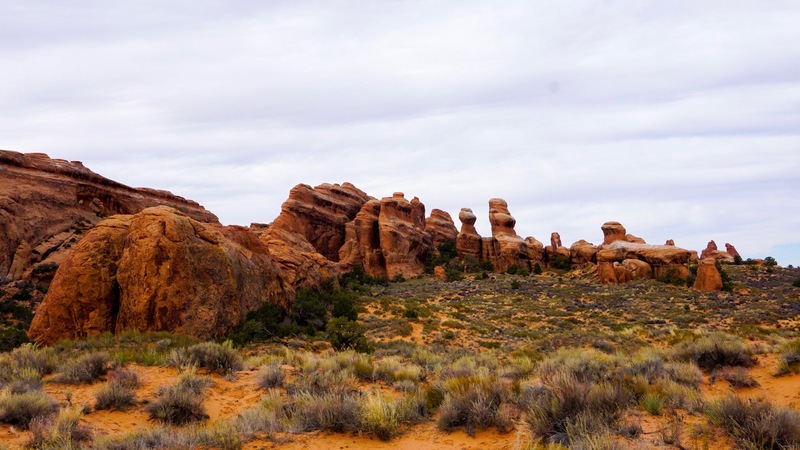 Arches National Park is full of surprises and wonder beyond the arches the park is named for. 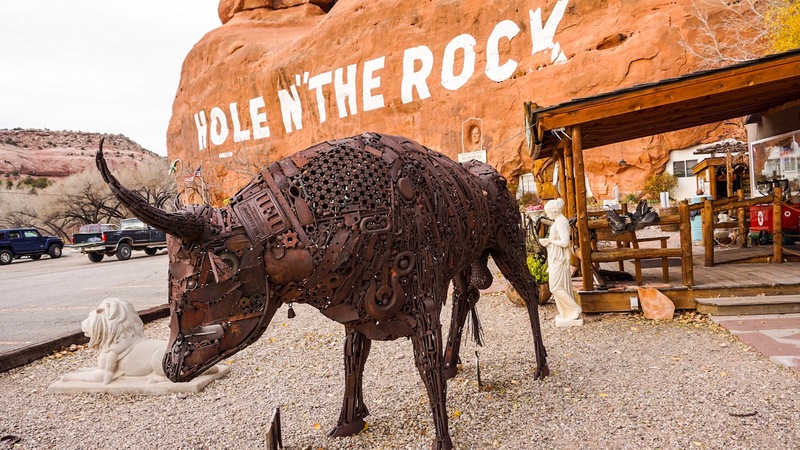 I stopped at this very bizarre roadside attraction with my mom, brother, and Lyse on our westerly road trip when I was 11. 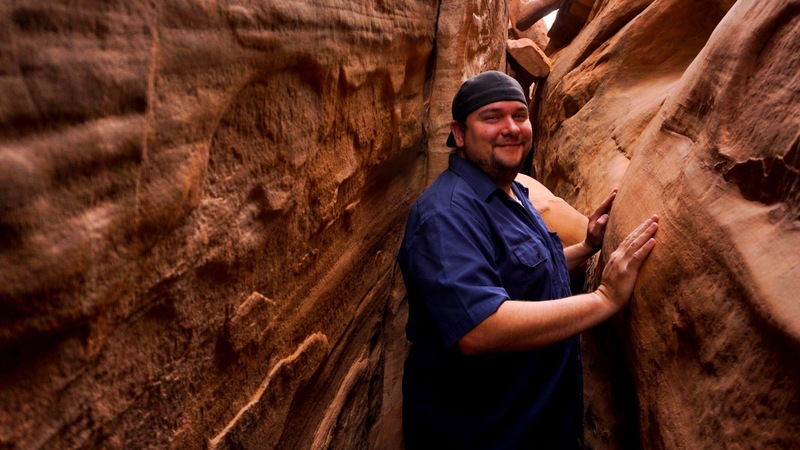 I’ve always remembered touring the very unique home that had been built into the side of the sandstone cliff just outside of town. I knew that I wanted to take Brandon here, but I wasn’t quite sure where to find it (I didn’t spend much time reading the maps when I was 11). I didn’t remember that this stop is right on the main highway into town and nearly impossible to miss. 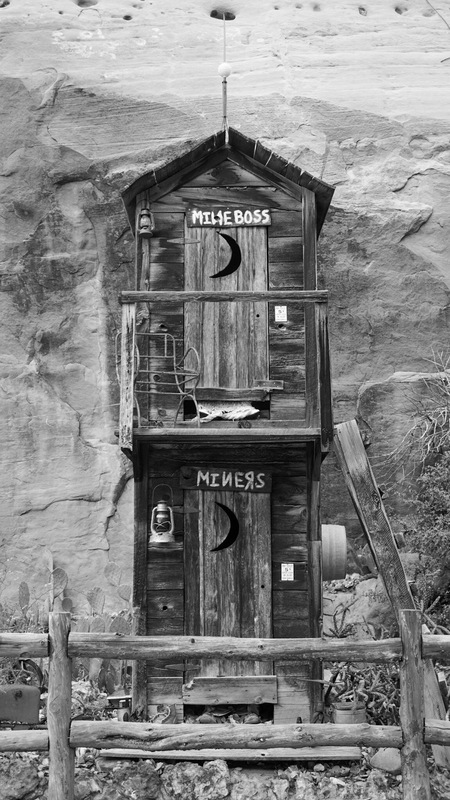 We drove right by it on our way into town in the RV! A few days later we returned in the Jeep. 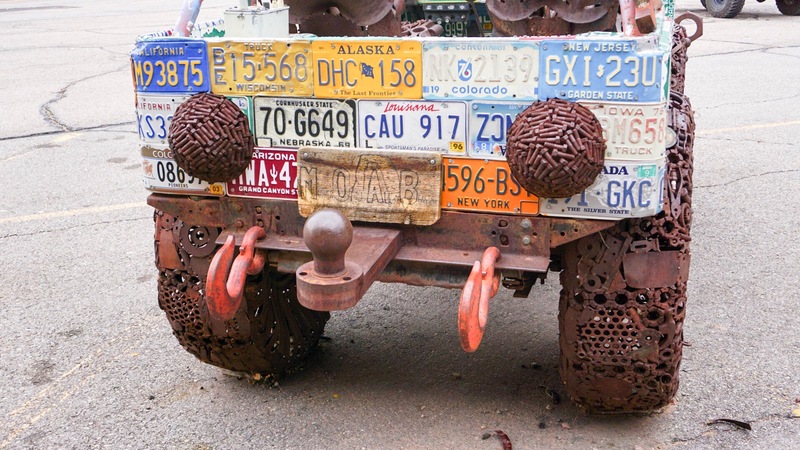 The memories from my youth are fuzzy and I don’t remember all of the metal art or the petting zoo. They may have been there then and they may not have. Either way, I think that the art and animals are actually more fun than the tour of the house. The house tour was honestly a little creepy. 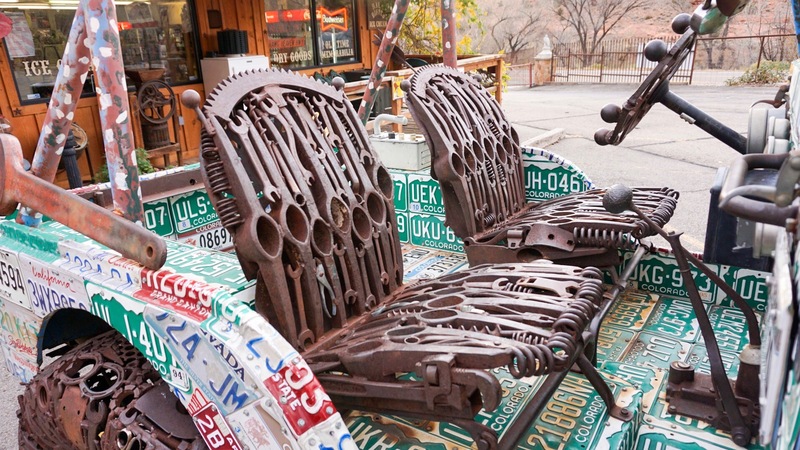 This place didn’t originate as a roadside attraction. It was actually a homestead from the 1940s. The couple that owned the property used dynamite to blast large holes into the rock. They then enclosed the holes with wooden fronts to form the rooms of their home. They also ran a small diner and gift shop from one area of the house. What made the tour so creepy was our tour guide. She was clearly following a memorized script, complete with fake laughter. We couldn’t look at her without being weirded out. Even her voice changed when she started the tour. While chatting inside the gift shop she sounded completely normal. Once we walked beyond the curtain to begin the tour of the house she became a high-pitched robot with forced, intentionally timed giggles. The builder of the house, Albert Christianson, was a sculptor, barber, engineer, and amature taxidermist. We weren’t allowed to take photos within the house. If we had, we could have shown you the über creepy stuffed donkey in the living room. The donkey was a family pet and eventually became Albert’s first attempt at taxidermy. It wasn’t pretty. Albert butchered the job and the donkey was left with visible stitches down the front of his partially smashed-in face. The stuffed donkey was put on display in the living room anyway, left to creep out generations of visitors for years to come. 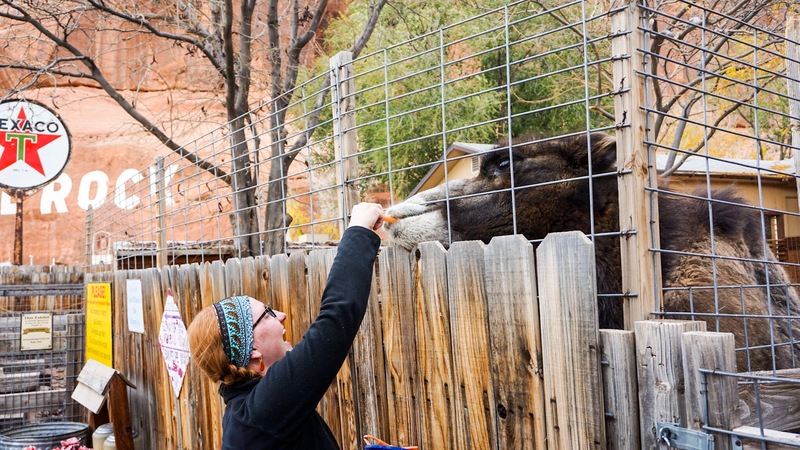 I honestly preferred walking through the petting zoo to touring the hosue. 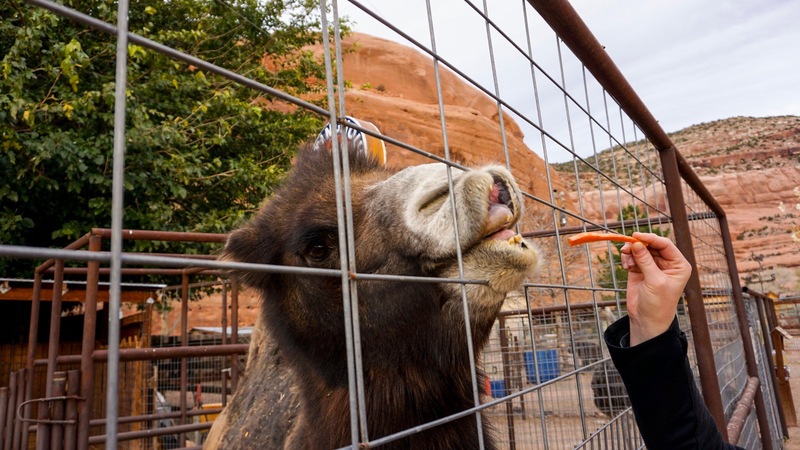 For a few bucks you get entrance to the small zoo and a bucket of carrots and Cheerios to feed the critters. The camel was my favorite. He followed me around begging for more food. He was a surprisingly gentle eater despite being so ginormous. 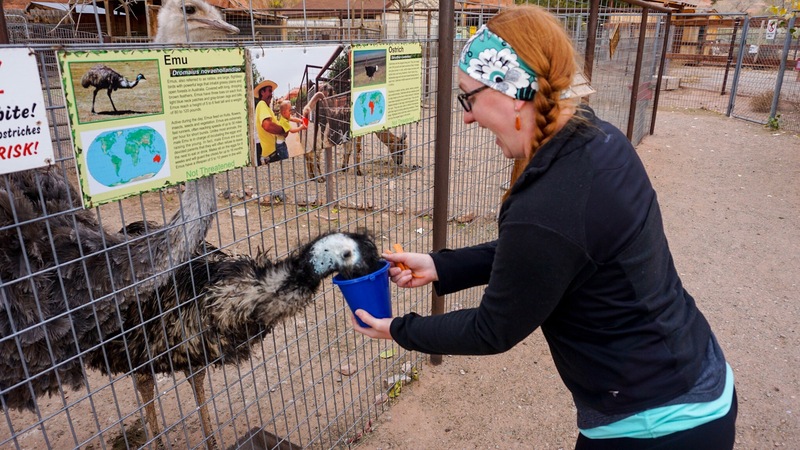 The ostriches and emus, not so much. I could only feed them directly from they bucket. They would have pecked a hole right in my hand to get ahold of those cheerios. For the record, we didn’t add the music to this video after the fact. 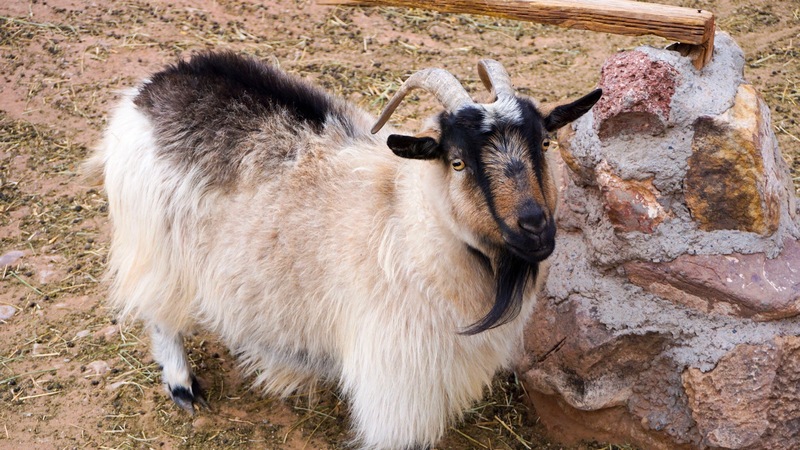 For some strange reason, they choose to play dramatic movie soundtracks inside the petting zoo. Some things will just never be explained. I hope you are enjoying your little taste of Moab as much as we did. Remember to keep a look out for Moab Part II, which should be published shortly. 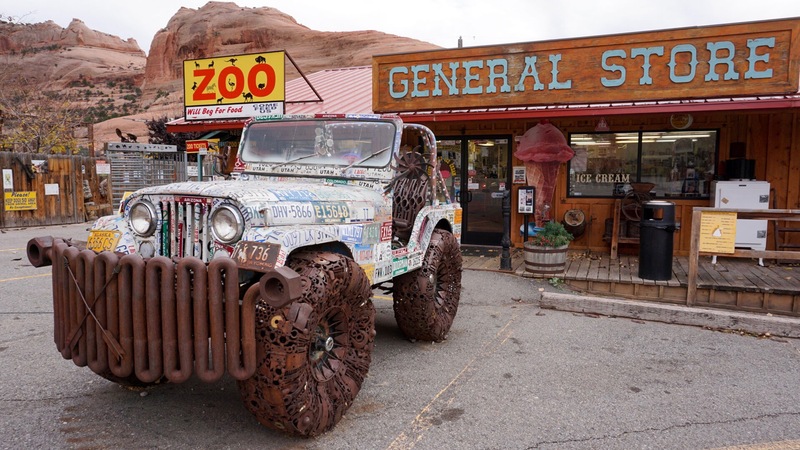 In part two we will be covering all things Jeep and Brandon will be making another appearance as the guest blogger! 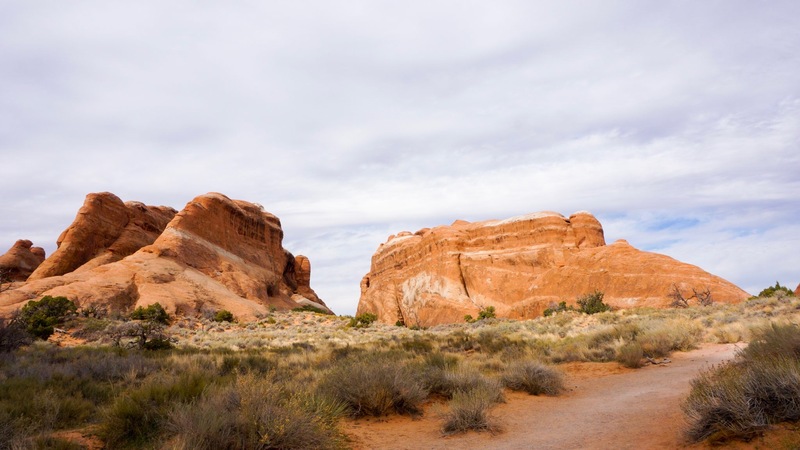 Posted on November 20, 2016 December 7, 2016 by alpha1ontherunTagged Arches National Park, Baby Lion's Back, Delicate Arch, Jeep, Landscape Arch, Moab, Nomads, RVing, Sand Dune Arch, sand lake recreation area, Utah. Enjoyed your post. I will always remember fondly our full moon over Utah tour. Glad you got to go back. Love you, Mom. Very nice write up, beautiful pics, going in July with my son, thanks for the info. Thanks! So glad our experience was helpful to you! 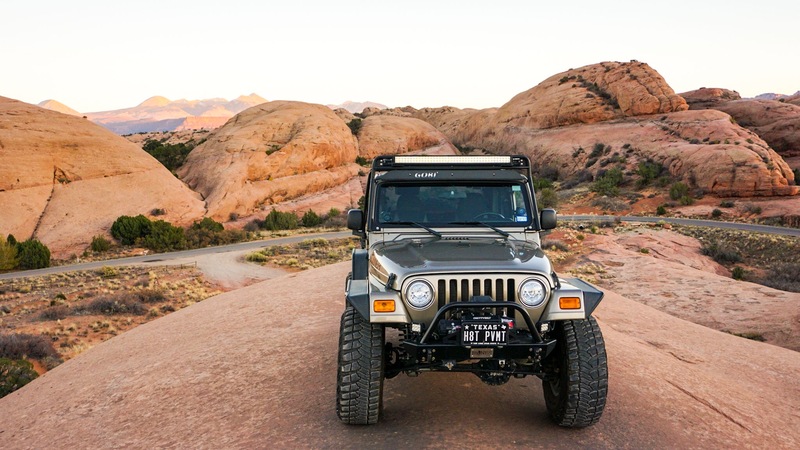 We loved Moab and can’t wait to go back ourselves.